I had a really good time with Martha Stewart, who also is somebody I really admire a lot. I've learned a lot from her and I think all of America has, about attention to detail and using fresh ingredients and making things beautiful and special. 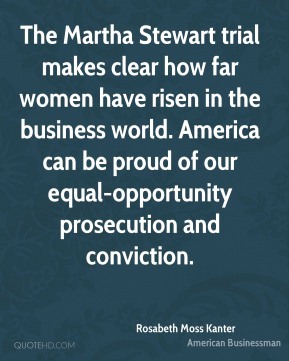 The Martha Stewart trial makes clear how far women have risen in the business world. America can be proud of our equal-opportunity prosecution and conviction. I did go through a period where I was on unemployment. 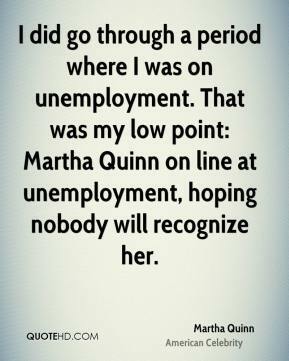 That was my low point: Martha Quinn on line at unemployment, hoping nobody will recognize her. I have a new joke today. Martha Stewart's on suicide watch. 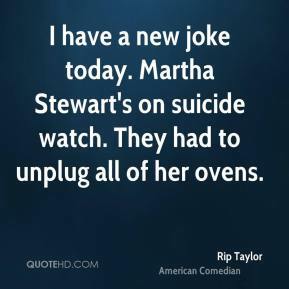 They had to unplug all of her ovens. I was privileged to be able to study a year with Martha Graham, the last year she was teaching. 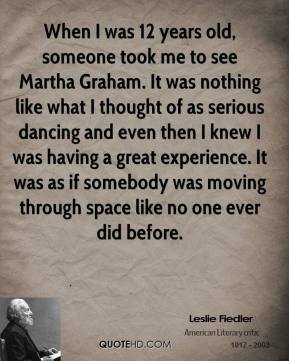 When I was 12 years old, someone took me to see Martha Graham. It was nothing like what I thought of as serious dancing and even then I knew I was having a great experience. It was as if somebody was moving through space like no one ever did before. 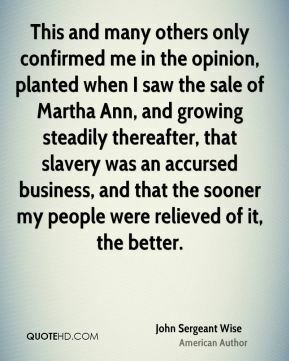 This and many others only confirmed me in the opinion, planted when I saw the sale of Martha Ann, and growing steadily thereafter, that slavery was an accursed business, and that the sooner my people were relieved of it, the better. 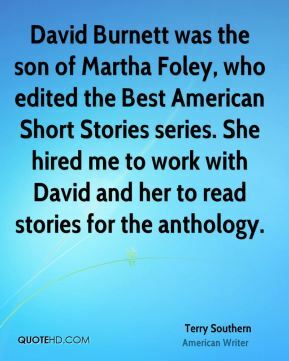 David Burnett was the son of Martha Foley, who edited the Best American Short Stories series. She hired me to work with David and her to read stories for the anthology. 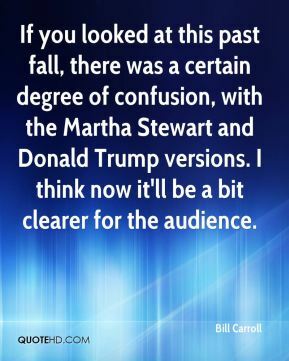 If you looked at this past fall, there was a certain degree of confusion, with the Martha Stewart and Donald Trump versions. I think now it'll be a bit clearer for the audience. 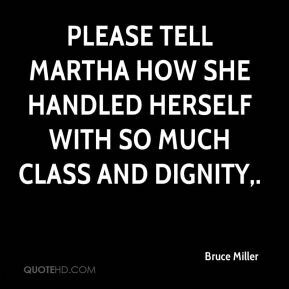 Please tell Martha how she handled herself with so much class and dignity. 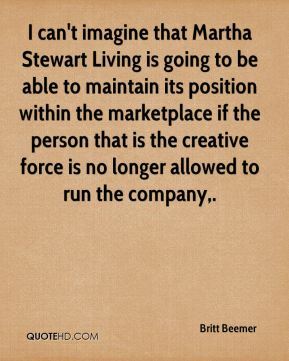 I can't imagine that Martha Stewart Living is going to be able to maintain its position within the marketplace if the person that is the creative force is no longer allowed to run the company. I wanted to be Martha Stewart, ... but without the stock scandal. I haven't really followed her story that closely. But I still think she's a good businesswoman with great shows. [If you're to believe either unflattering film, Martha isn't funny, witty or much of a pleasure to be around.] Behind Bars ... that if (Stewart) came in the room right now, I might make a fast exit. 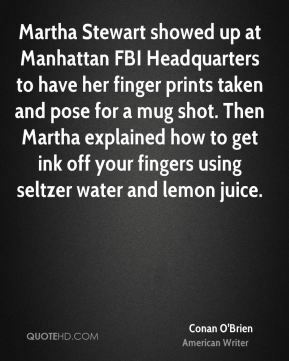 Martha Stewart showed up at Manhattan FBI Headquarters to have her finger prints taken and pose for a mug shot. Then Martha explained how to get ink off your fingers using seltzer water and lemon juice. I am thrilled to have been chosen by Martha Stewart as her apprentice and to work with the team at Body + Soul. This is a fantastic opportunity to have a significant impact on the continued success of this magazine. 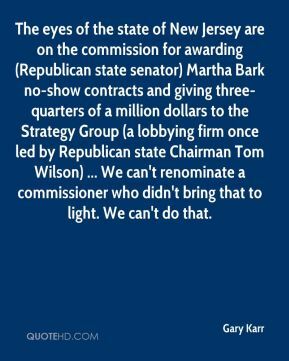 The eyes of the state of New Jersey are on the commission for awarding (Republican state senator) Martha Bark no-show contracts and giving three-quarters of a million dollars to the Strategy Group (a lobbying firm once led by Republican state Chairman Tom Wilson) ... We can't renominate a commissioner who didn't bring that to light. We can't do that. [As Martha Burk can attest, Johnson is not the most tender of pen pals. He blew off Wyman in a response dated Nov. 22.] Obviously I was disappointed to receive your letter, ... Although I respect your right to disagree, I must tell you that the Executive Committee unanimously adopted our present position on membership, and the overwhelming majority of our members are in complete agreement. I want you to also know that there is no timetable for the admission of women into our membership, nor do I expect there to be one in the foreseeable future. If you feel compelled to resign, we will certainly understand. 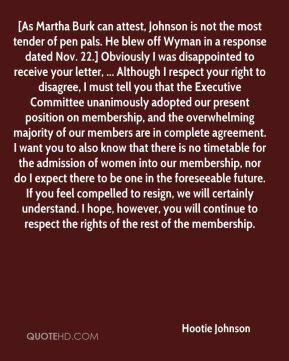 I hope, however, you will continue to respect the rights of the rest of the membership. 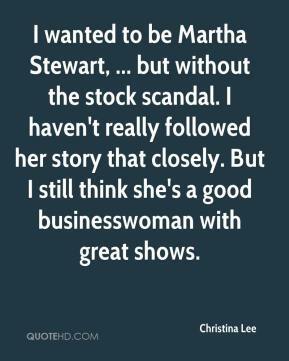 [But Martha Stewart is no Steve Madden.] 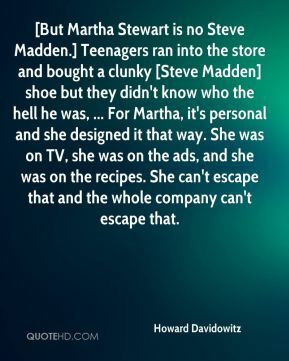 Teenagers ran into the store and bought a clunky [Steve Madden] shoe but they didn't know who the hell he was, ... For Martha, it's personal and she designed it that way. She was on TV, she was on the ads, and she was on the recipes. She can't escape that and the whole company can't escape that. 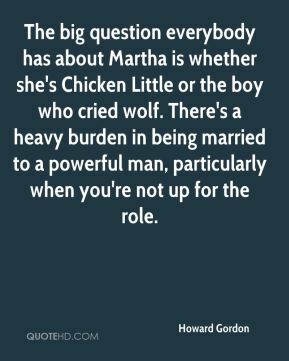 The big question everybody has about Martha is whether she's Chicken Little or the boy who cried wolf. There's a heavy burden in being married to a powerful man, particularly when you're not up for the role. 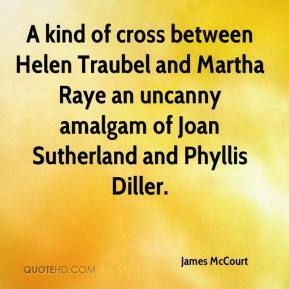 A kind of cross between Helen Traubel and Martha Raye an uncanny amalgam of Joan Sutherland and Phyllis Diller. 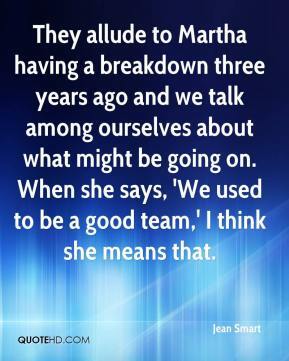 They allude to Martha having a breakdown three years ago and we talk among ourselves about what might be going on. When she says, 'We used to be a good team,' I think she means that. 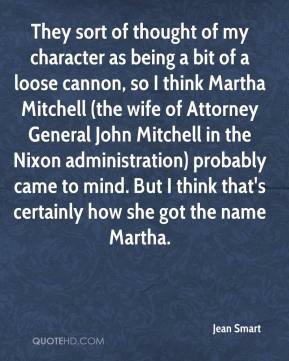 They sort of thought of my character as being a bit of a loose cannon, so I think Martha Mitchell (the wife of Attorney General John Mitchell in the Nixon administration) probably came to mind. But I think that's certainly how she got the name Martha. This is not a classic setting where someone gets barred for conduct as a corporate officer. 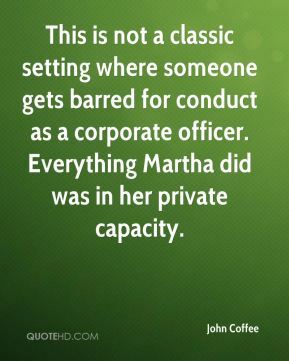 Everything Martha did was in her private capacity. Yes! Finally captured Martha Stewart. 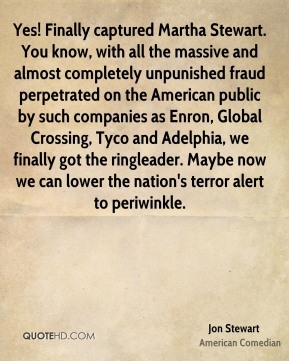 You know, with all the massive and almost completely unpunished fraud perpetrated on the American public by such companies as Enron, Global Crossing, Tyco and Adelphia, we finally got the ringleader. Maybe now we can lower the nation's terror alert to periwinkle. Like others, Kathie Lee Gifford, Martha Stewart, Drew Barrymore, Halle Berry and Jennifer Capriati, to name a few, women generally like Winona, and empathize with her, feeling that she is being treated improperly.